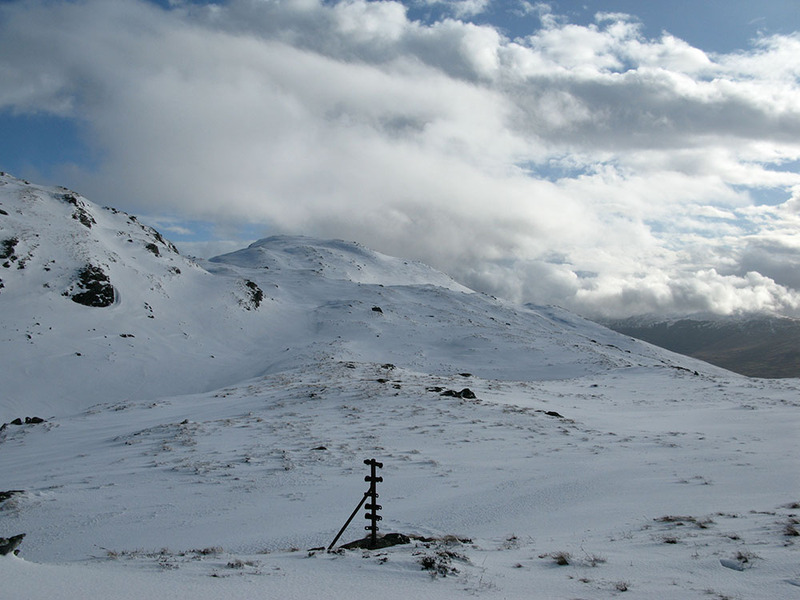 Winter mountain walk in Balquhidder – and no Munros! Posted by Eddie & filed under Mountains & hills, February 23 2010. Last week I went walking in the Balquhidder area of the southern Highlands. I walked up Kirkton Glen through fir plantations and to the col at the head of the glen where there is an impressively large rock called Rob Roy’s Putting Stone below the crags of Leum an Eireannaich. From there I walked along the tops of Meall an Fhiodhain, Cam Chreag and Meall an t-Seallaidh, which form a high ridge about 4km long that nowhere goes below 700m in altitude, but also never goes above 900m, so there are no Munro summits on it. This means that it is not a well-visited area of the Highlands, but it still offers a proper mountain hike. There was also snow cover above about 700m on the walk, and intermittent showers of snow that reduced visibility so although not a high elevation walk it was a proper winter mountain route requiring careful navigation and the use of crampons and ice axe. There wasn’t much in the way of views on the walk due to the snow showers and cloud but at the end of the route descending down the steep grassy southern slopes of Meall an t-Seallaidh there was an impressive view westwards along Balquhidder Glen. Kirkton Glen was also on the route of the first wild camping expedition I ever went on, way back in 1984 whilst at school.